Why am I telling you this now that it’s warmer weather? Because — air conditioning. One busy afternoon, I was sitting at my desk writing away, and thinking, wow… it’s really cold in here! I need to put socks on because my feet are so cold they hurt! But– deadlines… So I kept writing. Within a day and a half — I was sick. With a cold that quickly turned into bronchitis! And now I know — it was the cold feet that did it. 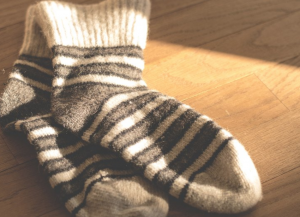 Wherever you go — the grocery store, the doctor’s office, the movie theater, and churches — bring a sweater, and cover your feet! Becuase it’s cold in there!